During the winter season, Cardrona is well known as one of New Zealand’s best ski resorts. 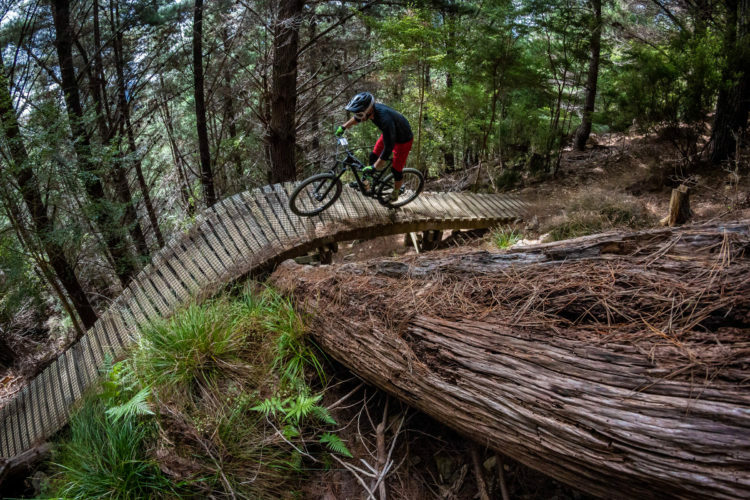 Famed for its park riding the world over, Cardrona also has a reputation for great trails with good progression. The bike park prides itself on the quality and friendliness of their staff, and how family-friendly and accessible the resort is. As it turns out, much of this is true for their summer season as well, but not many people are in the know yet. Cardrona is in its fourth summer season now, having been open as a winter ski resort since 1980. 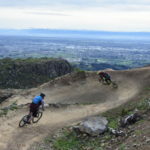 Gaining traction as a mountain bike resort can be tough, with other local ski fields including Coronet Peak and Dirt Farm (Snow Farm) having tried and failed or given up in short order. Cardrona are sticking to their guns, however, and the place is improving year on year. Cardrona blue trails: Smiles for miles. 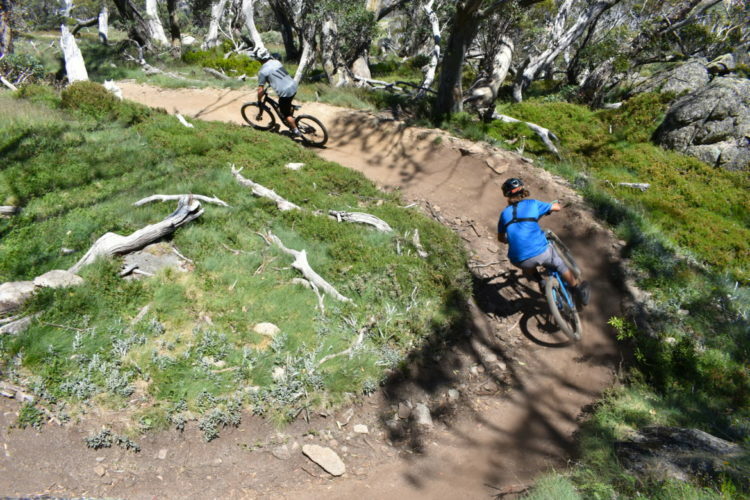 With (give or take) 24 trails serviced by two lifts spanning 600m of vertical terrain, and totalling over 25km in length, there’s plenty for mountain bikers to enjoy. Though not the most expansive network, Cardrona prefer to focus on quality, rather than quantity. With BikeMorzine CEO Russ Paver working as trail boss, it’s no surprise that the riding here is top notch. 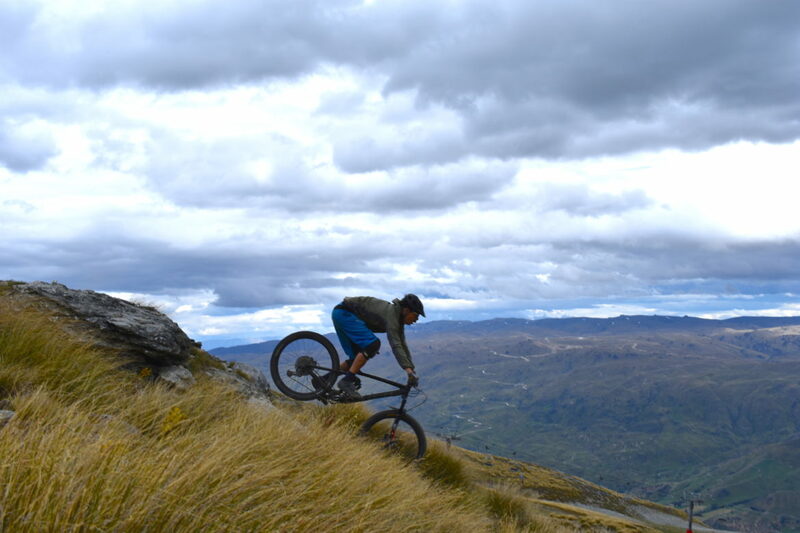 For a start, riding at Cardrona is like nowhere else. The barren, high-alpine tussockland of Central Otago is almost like a moonscape, and is totally different to the alpine meadows of Europe and North America. In many places, it feels like real wilderness. 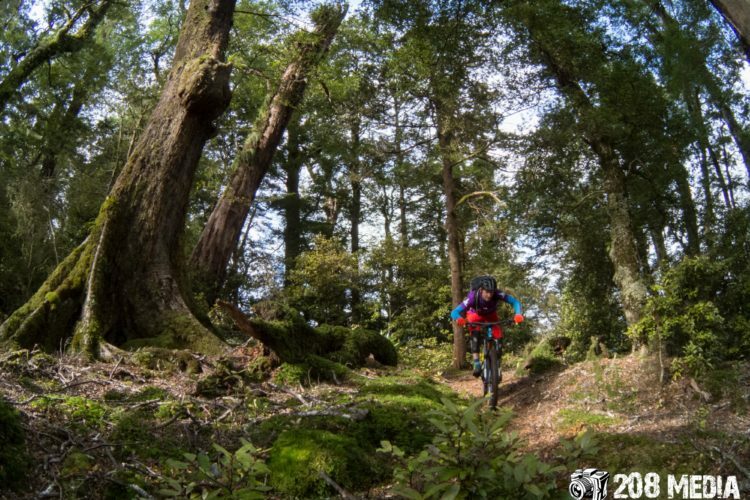 The lack of trees here means that trail builders can take full advantage of the available terrain and features, whilst the rider benefits from incredible panoramic views. What could be better? 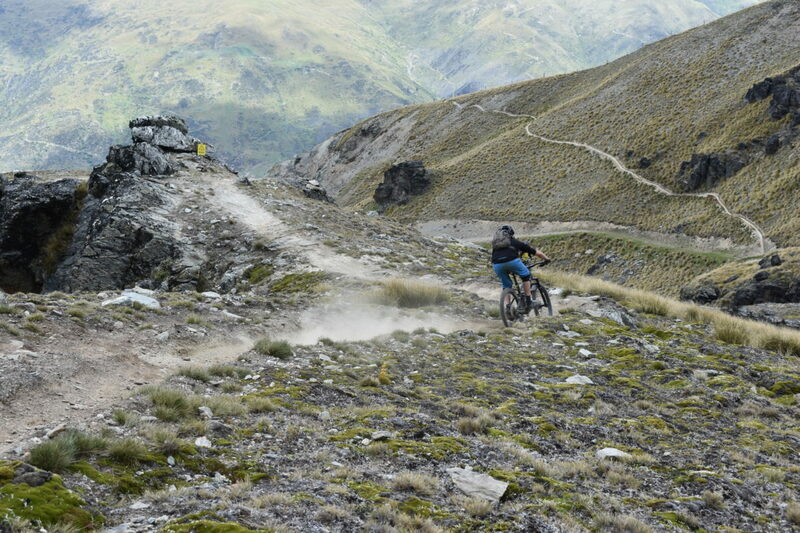 The green trails at Cardrona are incredibly well-built. 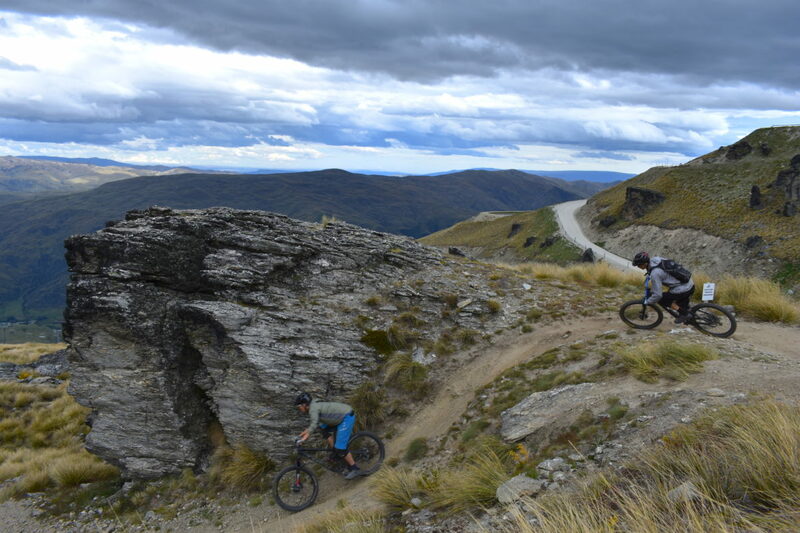 With Cardrona being marketed as a family resort, they have to have some beginner- to intermediate-level trails. This is where a lot of bike parks fall down, but the green trails here are great. Sweet As, running into Morning Glory, are amazingly fun roller-coaster trails. What they lack in technicality, they make up for in flow and features. The builders have done a nice job, keeping the trails smooth and easy for less-skilled riders, with sneaky lumps that can be doubled up, berms that can be gapped, and a whole host of other cheeky trail features that make these green trails seriously fun for all riders. Moving up to the blue trails, Prospector is the next trail in a network of well thought out trails with excellent skills progression. A little narrower than the green trails, and with a few small technical features and jumps, Prospector leads well into Arcadia and Ridge Rider. These trails are very rideable by intermediate riders, but again flow very well with great berms, short technical sections, and advanced features. All features are flagged and signposted, so there’s no danger of hitting them by accident. Still, these trails give more advanced riders a little more adrenaline on trails that are great fun in their own right. Arcadia, for example has a couple of really sweet rock drops and step downs as well as some fun rock gardens. Grasshopper into High-Vis is Cardrona’s jump line. Starting with small tables and hips, this combo ends with a couple of bigger tables around 15ft in length with optional longer take-offs. Not to worry though: there are 100% rollable options all the way down. Cardrona are also working on building a new, bigger, and better jump line very soon. One of the fun optional lines on Arcadia. The black trails, tighter again and with more technical sections, are still a lot of fun. DTL is a really natural-feeling track, barely wider than your tires in places. 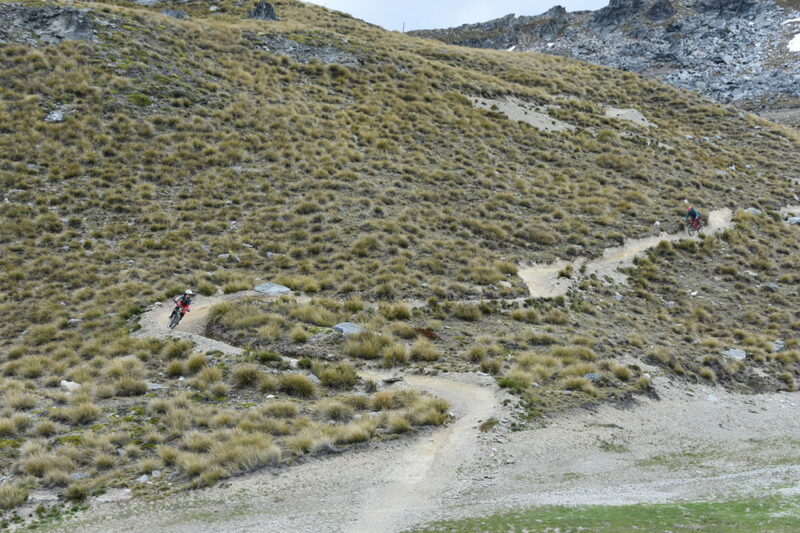 Roughed out between the tussock and alternating between high-speed threading the needle and negotiating steep chutes, it’s a true delight to ride. The other black trails consist of Dirtstar, a nationals level downhill track, and a bunch of optional sections on other trails. If you like fast, technical, rocky trails with big features, then you’re going to love Dirtstar. It’s fast, technical, and steep. Linked up with Long Black, the double-black at the bottom of the park, this is a LONG trail, and it only gets harder further down! It does get more steep and technical at Cardrona, This chute is serious fun. To cap it all off, Cardrona has their locally famous Peak to Pub trail. 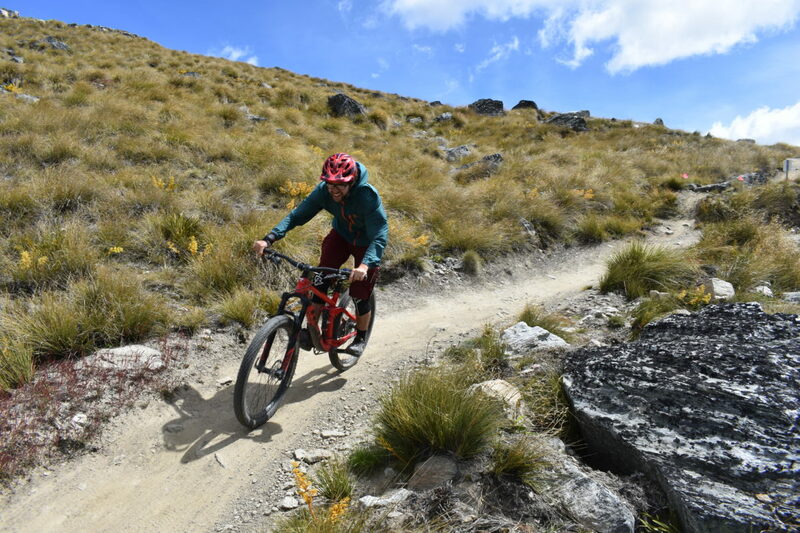 Starting from the resort base, you can ride down Crankshaft (a super-fun blue trail with some sweet optional jumps and drops), out of the park, and all the way down to the historic Cardrona Hotel at the valley floor, approximately 1,270 vertical meters below. Crankshaft shuttles run in the afternoons, and previously Peak to Pub was a guided ride only once a day at 4pm. As of January 20, 2019, the route can be ridden all day, the only catch being you have to organize your own ride back up. Some parts of the trail are scratched-out backcountry trail, and some of the higher parts are recently super-groomed bike park trail. Either way, it’s an absolute blast and an awesome way to end your day. 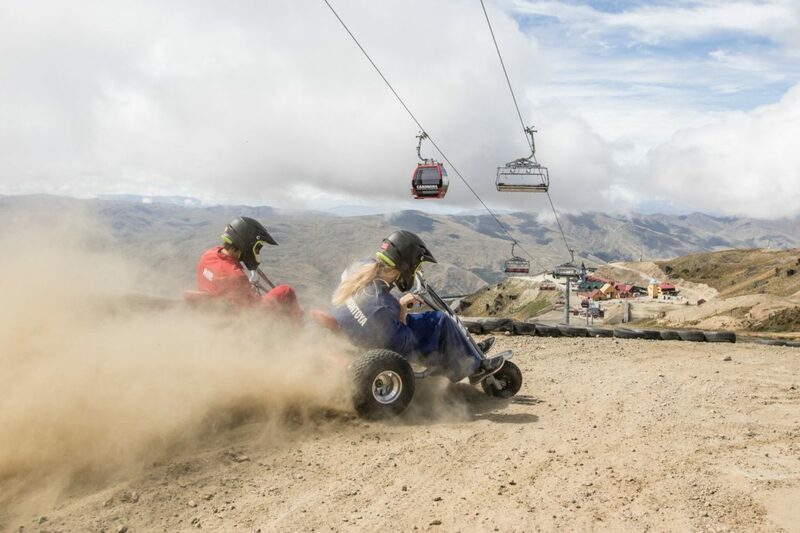 The mountain carting at Cardrona is crazy fun! 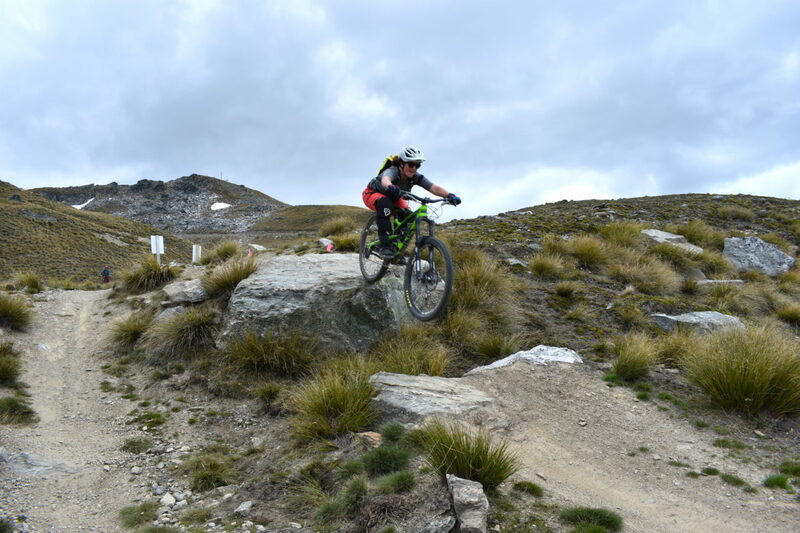 Cardrona isn’t just about the bikes, though that is the main draw. They also have mountain carting. The concept is similar to mountain luge, but uses super-low, off-road trikes with chunky tires. Completely gravity-powered, you take the lift to the top and get two hours per session to explore the three trails on offer which follow what are usually ski pistes in the winter. Carting is super fun; there’s a lot of potential to absolutely rip down the mountain and get some crazy sideways drifts on. You’ll get a full face helmet, goggles, and overalls to keep you safe while you’re barreling down. It’s an awesome way to keep your kids/partner entertained while you’re riding. That said, it’s so much fun that you might as well give it a go while you’re there! The mountain is also open to hikers. The area is truly stunning, and pedestrians can take the gondola to the top and take a walk around the peak. 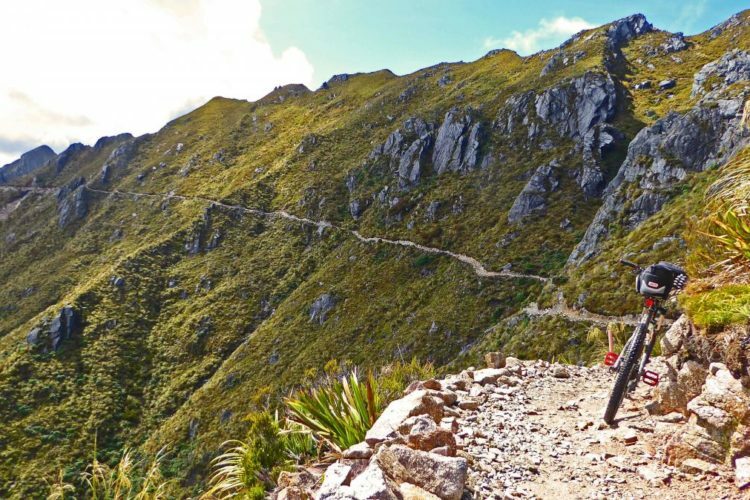 There are multiple marked hiking trails of varying difficulty, with loads of photo-ops and views back down to Wanaka and Queenstown. Seriously, this place is crazy beautiful. If you’re on the mountain after close, they also offer guided stargazing tours with a professional astronomer. The night sky in Central Otago is beautiful, and what better way to see it? 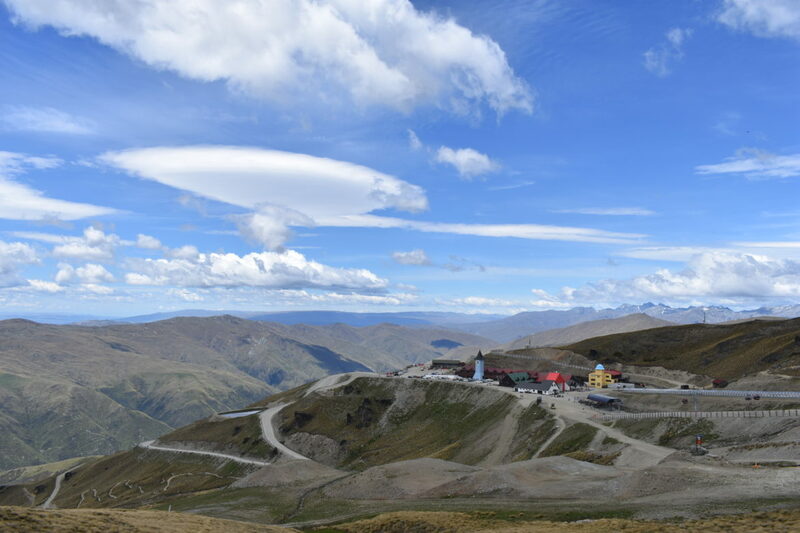 As Cardrona is a fully-functioning ski resort in the winter, it’s no surprise that they have excellent facilities, though not all of them are open during the summer. Ticketing doubles as a gift shop and they have a good range of riding kit, hats, sunnies, etc. The Lounge Cafe/bar serves hot and cold drinks all day, with excellent baristas and top-notch food, including a BBQ and wood-fired pizza oven. A large fleet of mountain bikes (and carts!) are available for rent. This season they’re running Trek, so they have Remedies and Sessions. They also have a small supply of common spares including brake pads, tires, tubes etc. On the mountain there are also a number of modern and luxurious serviced apartments. This is a good option if you intend to stay for more than one day, as it’s a fair drive to the bottom. Staying here is a bit special, as you essentially get the mountain to yourself in the evening. Very few other guests means it’s quiet here, perfect for enjoying an amazing alpine sunset. The restaurant is also open to apartment guests in the evenings, and the food is both plentiful and delicious. 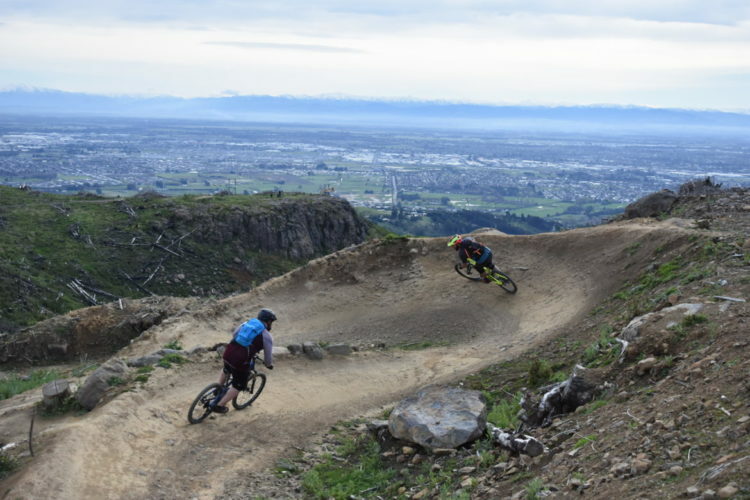 In addition to the National downhill champs that Cardrona has hosted for the past few years (though not for 2019), they also host a bunch of other events throughout the season. These include a mass-start megavalanche-style race, a couple of gravity enduro races, the Trek Dirtstar Downhill race, and Fast Fridays, a casual Friday evening race series. The lifts are open 10am – 4pm, (10am-6pm Dec 26 – Feb 10), and stay open until 8pm on Fridays. 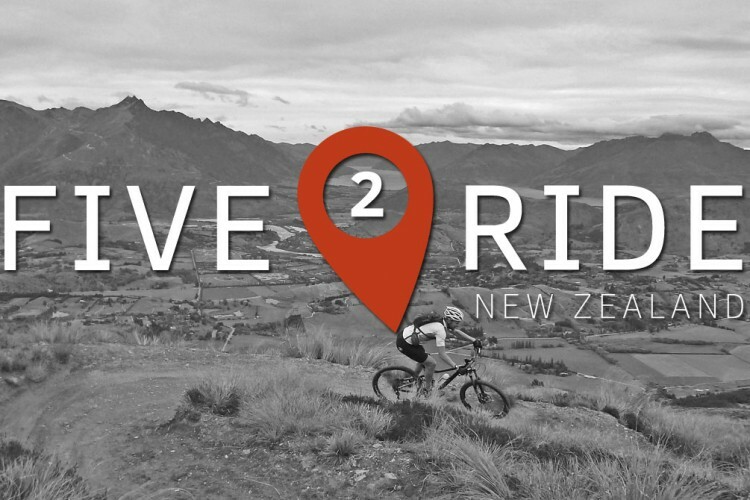 Cardrona offers a few different pass options: $70 (NZD) for a half day, $90 for a full day. There are options for transport from/to Queenstown, and there’s an optional extension for Fridays when they’re open to 8pm. There is also a season pass available for $499. Concession pricing is available. Cardrona resort is situated between Wanaka and Queenstown on the Crown Range Road. About 45 minutes from Wanaka and a bit over an hour from Queenstown, the drive is all tarmac from both directions until you hit their access road, which climbs about 1200m in 13km on gravel. It’s not too rough, but you’ll want to make sure your car can handle it. It also may not be insured as it’s a private road. Wanaka/Queenstown are roughly a 5.5 hour drive from Christchurch, the largest city on the south island, and about 3 hours from Dunedin. Queenstown has an international airport and is also relatively easy to get to. 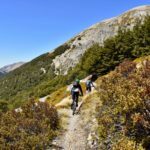 There are plenty of Airbnb places, hotels, campsites, and hostels in Wanaka, Queenstown, and in Cardrona village, in addition to the on-mountain accommodation. While there are plenty of units available, Cardrona is very busy during the summer, particularly over Christmas/new year and Easter, so make sure you book ahead of time. It’s not uncommon for hostels to be booked out weeks ahead. 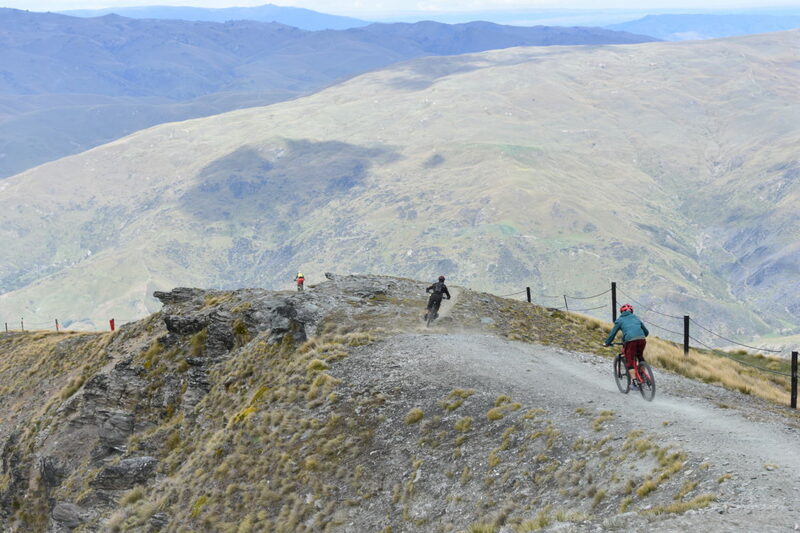 In summary, Cardrona is an awesome riding spot and has enough riding to make most people happy. It’s not full of super gnarly trails, though there is some gnar there. It suits the modern breed of trail bike/enduro rider really well, with loads of fun trails to ride and excellent progression. The quality of the trails, facilities, and the staff make this place a hidden gem that not many people know about. Get in there for a ride before everybody else discovers it! 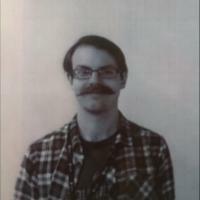 Not much is known about samjames2018, though the legend grows each day.